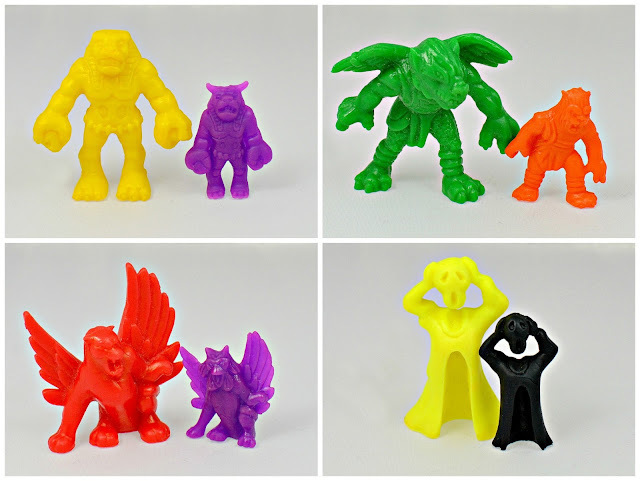 WHAT: If you're like me and you've spent too much time researching mini figure lines, you're probably aware that items related to Monster in My Pocket have been released in many different countries over the years. Some of these items have unique/strange characteristics in comparison to the original, standard release of Matchbox's MIMP figures. One example of this is the extra-mini monsters pictured above, released as "Juguete Halloween." 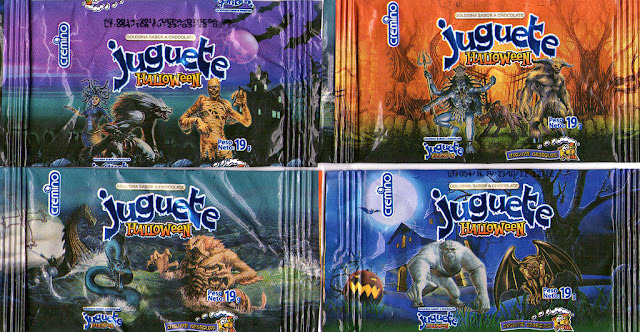 These figures are Peruvian versions of MIMP figures that came blind bagged as toy premiums along with chocolate, featuring sculpts based on the Matchbox figures, but smaller and in some cases significantly modified (check out Cockatrice's head on the Winged Panther! Or the Beast's head on Tengu!). They are kinda funny-looking but I dig 'em--they're a cool little section of the MIMP universe. I am pretty sure these premiums came in five colors: Black, orange, purple, red and yellow. And with the following monsters making up a set: Mummy, Vampiress, Ghost, Tengu, Medusa, Witch, Kali, Werewolf, Bigfoot, Karnak, Cyclops, Triton, Cerberus, Great Beast, Winged Panther, Skeleton, Harpy. WHEN: These particular figures were offered fairly recently, around 2010, but I believe the mini Peruvian MIMP sculpts have been around since the 1990s. WHO: Produced by a company called Cremino. Nice little things though, I'd happily scoop those up in the newsagents if I was a Peruvian. Or if they were sold here, even. I like how they've given Karnak some little horns as well. No solo en Perú fueron sacadas las figuras de MIMP, también en Colombia para principios de la década de los 1990's. Fueron lanzados por la empresa "Crem Helado" como premio sorpresa de un producto llamado "Paleta Drácula", helado que se vende anualmente entre los meses de septiembre y octubre. Años después este helado sacó sus propios monstruos, algunos de ellos incluían accesorios y una tarjeta con una historia personalizada.